Calvin is the smallest guy in his high school, and a perfect target for Rozelle and her girl gang. His mother is dead, his father is long gone and his only remaining relative, his grandmother, is getting too sick to run her dry cleaning business. The only time Calvin feels in control is when he's working his yo-yo. When he takes up street performing, Rozelle demands a cut and insists on being his manager. To get media attention, she markets him as a yo-yo genius who can predict the future, dubbing him the "Yo-Yo Prophet." Calvin begins to believe his own hype, but as Gran's condition deteriorates, he realizes that it will take more than fame and adulation to keep his family intact. "I found myself glued to this story...[It's] light and kind of sweet but it moves along at a good pace. I really enjoyed the incorporation of 'old school' yo-yo tricks and how Calvin uses that to overcome a difficult stage in his life. The book shows that circumstances can leave you spinning on the end of a string, but somehow Calvin manages to hone his skills and grow up a little, too." "So many reasons to love The Yo-Yo Prophet: the way the main characters change throughout the book (especially the main character, Calvin, who so desperately wants to be noticed and feel special), the tension and excitement of Calvin's yo-yo performances and competitions, how Calvin reacts to and eventually finds a way to cope with bullying, how he deals with his missing father and the declining health of his grandmother. Uplifting and hopeful ending without being clichéd. I was also intrigued by the description of the yo-yo feats! This book might even lure young people away from their computer games to give a non-digital hobby a try." "A very quick and fascinating read with the yo-yo tricks moving the action along nicely." "Krossing weaves a well-paced coming-of-age story with a diverse set of finely drawn characters. Calvin's awkwardness, Rozelle's brash style and her friend Sasha's jealousy feel authentic, and Calvin's attempts to remain true to himself while negotiating high school and the larger adult world will ring true for many young readers. Readers will root for Calvin as he tries to hold his family together while making difficult choices and will be rewarded by a satisfyingly happy ending. Best of all, Krossing's descriptions of yo-yo tricks are vivid and tangible enough to make some readers reach for a yo-yo of their own." "My son LOVED The Yo-Yo Prophet and read it in record time. He even started playing with his yo-yo again and then recently made one. He highly recommends this book to his friends. It has initiated him reading every night at bedtime again and I am truly grateful for that." "Calvin's personal growth as he overcomes his shyness with his peers and his estranged father is heartwarming...The story is a nicely paced, enjoyable read, and most kids will find themselves compelled to finish it." "The urban characters are diverse and the relationships feel authentic. Krossing's descriptions of bullying are powerful. Students 7th grade and up will connect with this story about finding our real family and owning our actions." 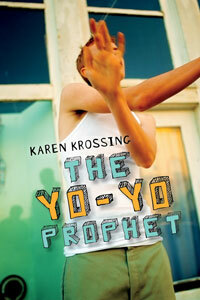 "The title and cover art will attract middle school boys to The Yo-Yo Prophet...[and they] might be taken with yo-yos. Give it a try." "Krossing's use of terse, but vivid imagery depicts a torn young man struggling to fit into a teenage world unaware of the larger problems of his life at home. The Yo-Yo Prophet takes the reader along Calvin's journey, showing how a normal kid's fears, inadequacies, and defeats lead him to grow and make decisions that enable him to become more of the young man he wants to be." "Krossing's light, straightforward style presents the 'big' issues of bullying, self-discovery and loyalty in accessible and inspiring ways. Watching Calvin cope with each of these issues invokes empathy and instruction. Her description of yo-yo tricks is exceptionally strong." "Krossing has created a fresh and engaging story that [is] intricately crafted, yet easy to follow. Of particular note were the different terms and descriptions for yo-yo tricks and techniques...The success of The Yo-Yo Prophet lies in its innovative plotline coupled with superior character development. The reader is privy to Calvin's fascination and aptness with a yo-yo, adding an enhanced level of playfulness to this highly enjoyable read. Highly Recommended." "Calvin is a likable character who is struggling to keep it together under the mounting stress, the relationship between Calvin and his grandmother is realistically portrayed, and the eventual resolution with Calvin's dad feels authentic. Meanwhile, the yo-yoing scenes are surprisingly vivid and keep the action moving. Readers will root for Calvin to stand up to Rozelle and triumph in the end." "Krossing paints vivid and believable portraits of her main characters and keeps the action flowing, especially in her descriptions of Calvin's performances. She manages to convey the intricacies of the tricks and Calvin's joy in mastering them while moving the narrative briskly along. It all adds up to a captivating and believable portrait of a young boy coming of age." "A great fluid read about the importance of being comfortable in one's own skin, putting family first over profit, sticking up for yourself, and recognizing true friends versus the phonies. I thoroughly enjoyed all the values, mentioned above, that were touched on throughout the story...The reader will be quite satisfied if he/she is looking for a happy, but realistic ending." "Krossing's...depictions of the many pressures Calvin is under, as well as his relationship with his grandmother, feel especially intimate and authentic. 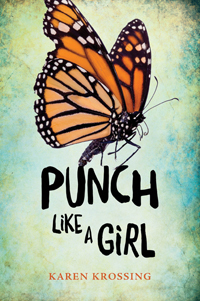 It's a clever and quiet coming-of-age story about developing confidence and doing what's right."